Acrylic is an amorphous thermoplastic polymeric material, which has superior clarity, exceptional weather ability and good chemical resistance. In addition, acrylic offers unique coloring and blending and can be provided with a frosted or diffused appearance. Acrylic is an excellent material for Point of Purchase Displays, signs, appliance, and LED light lenses. Acrylics are often sold under brand names such as PlexiGlas, Lucite and Optix. 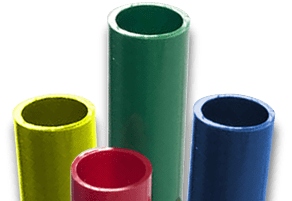 Acrylonitrile Butadiene Styrene is excellent for extrusion and is used for a range of applications such as refrigerator trims, bumpers for POP Displays, Piping or Tubing, HVAC parts, building and construction applications and toys. 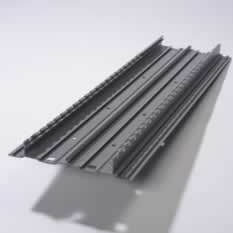 ABS is known for its impact resistance, toughness and light weight. Sunlight can cause ABS to degrade. HIPS is a material that’s well-suited for extrusion. Appliance manufactures use HIPS for Air Ducts, Wire Covers, and Retainers. In the POP market HIPS is used for Sign and Caption Holders. HIPS can be easily colored and is light in weight. Sunlight can cause HIPS to degrade and it is not very chemically resistant. Has a wide range of uses in extrusion from piping/tubing to building and construction applications. PVC is available in rigid and flexible durometers. Rigid PVC is strong, lightweight chemical resistant, and weather-able. Flexible PVC is used for gaskets and seals. Is known for its chemical resistance and toughness. PP is used in appliances and flue gas desulfurization scrubbers in coal-fired power plants. Glass Fiber and Talc can be blended into Polypropylene to provide further stiffness and rigidity. Because it degrades in sunlight, Polypropylene needs UV absorbing additives to protect it before it can be used outdoors. Low density polyethylene (LDPE) can be found in refrigerator tubing, High density polyethylene is a thermoplastic with high tensile strength and is used to make toys, milk containers, water filtration pipe, and corrosion resistant piping. PETG is a translucent thermoplastic that is great for impact resistance and can be found in Point-of-Purchase Displays. TPEs are more elastic than other thermoplastics and are used for gaskets, flexible grips, and seals. TPE’s have good color ability, UV resistance, weather-able, halogen free, ozone resistant, and adhesion. TPOs are combinations of PE (polyethylene), BCPP (block copolymer polypropylene), (polypropylene), rubber, and can be reinforced with a filler such as carbon fiber, fiber glass or talc. TPO’s are used for Trailer Skirts on Semi-Trailers and Air Dam’s on cars. This material is weather-able, chemically resistant, excellent stiffness, cold temperature impact (down to -40 degrees F), and low thermal expansion.